Here is an excerpt from a classic article from the March (1987) of Harvard Business Review written by Alan M. Webber It is based on his interview of Red Auerbach. To read the complete article, check out the wealth of free resources, obtain subscription information, and receive HBR email alerts, please click here. Former Boston Celtics star Bob Cousy calls him “Arnold.” But most diehard basketball fans know him as “Red.” Hanging from the rafters of the Boston Garden are 16 green-and-white championship banners, testimony to his managerial genius. 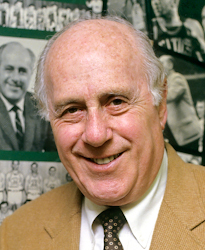 He is Arnold “Red” Auerbach — inspiration and leader of the most successful sports franchise in America. For 36 years, as coach, general manager, and now president of the Boston Celtics, Mr. Auerbach has practiced his style of management in an enterprise in which the difference between winning and losing is very clear and very public. His management philosophy, based on the values of loyalty, pride, teamwork, and discipline, is applicable to managers in any field. And the results he has attained—measured in athletic and economic terms, or even just in the number of victory cigars he has savored—demonstrate his ability to make this philosophy work. Mr. Auerbach is the author of On and Off the Court (Macmillan, 1985), written with Joe Fitzgerald. This interview was conducted in his Boston office by Alan M. Webber, [then] managing editor at HBR. Thirty-six years later, everybody talks about it. It’s at the heart of the Celtics’ mystique. What is it? It’s the whole idea of caring. I’m in contact with the Frank Ramseys and Ed McCauleys and Bones McKinneys who played for me 35 years ago. I know where they are, what they do. If they want something, they call me and if I want something, I call them. There’s a family feeling. Two people in particular evidenced it for me. One was Wayne Embry, who played at Cincinnati for nine years and came here to finish his career. He never talks about Cincinnati. He talks about Celtics pride and the Celtics organization. The other was Paul Silas. One of the best compliments I ever got was from Paul Silas. One day he came over to me and said, “I heard a lot about this Celtics pride and I thought it was a bunch of crap”—because he was an old veteran when he came here. “But,” he said, “I was wrong. I feel a part of it and this has been the happiest part of my career.” It was super. When you hear it from the players, it really makes you feel nine feet tall. What are some of the things that explain this special feeling? Well, it started way back, when Walter Brown owned the team. I had this theory, which we still use. And that is, a player’s salary is determined by what the coaches see and what I see. What determines a player’s salary is his contribution to winning—not his statistical accomplishments. I don’t believe in statistics. There are too many factors that can’t be measured. You can’t measure a ballplayer’s heart, his ability to perform in the clutch, his willingness to sacrifice his offense or to play strong defense. I’ve always eliminated the statistic of how many points a guy scores. Where did he score them? Did he score them during garbage time? Did he score them when the game was on the line? Did he score them against good opponents? There are so many factors. So part of the Celtics’ system is the way you set up the salaries? Well, it’s not just the money reward, it’s more than that. It’s like Larry Bird always says before a big game: “I’ll be ready and the other guys will be ready and we’re going to win this thing.” Not “I’m going to win it.” He says, “We’re going to win it.” Larry Bird gets as big a thrill out of making the pass as he does making the shot. One important thing is trust within our organization. I really believe that loyalty is a two-way street. Unfortunately, in most businesses managers expect loyalty from employees but are very reluctant to give loyalty. Most of our players have self-retired. They tell me when they don’t think they can play anymore. The Jones boys, Cousy, Russell, Havlicek, Sanders, Nelson, Heinsohn—they all announced their retirements with no pressure from me whatsoever. People who come here realize that if they produce and do the job as they should and are happy here, we’ll do our best for them. And we’re interested in what they do when they leave here, when their careers are over. What else goes into the relationship with the players? I think the players know that if I make a decision, we’re all going to stand with it. The players won’t con me because I don’t con them. They don’t give me what we call false hustle, when a guy just goes through the motions but he’s not really putting out much effort. How do you discipline your athletes? We like our players to play for fun and to be happy rather than afraid. It’s like that in any business. If you have employees who work through fear, you’re not going to get any ingenuity out of them. You’re not going to get any employees who will take a gamble or come up with ideas. All you’ll have are robots that are going to do their jobs, have a low-key approach, stay out of trouble. They’ll put in their hours and go home. But I’d rather have it the other way. So we talk to people. We don’t fine them indiscriminately. A lot of teams have rules that say if you’re late or miss a plane, you get fined. We have rules, but we temper them with mercy. We talk to people. And we never threaten employees specifically. What I used to do when I coached was this: I wouldn’t say that if they did something I’d fine them a thousand dollars or I’d suspend them; I’d just say that if they did something I’d bust their hump. So then they’d wonder, what is he going to do? Alan M. Webber is an award-winning, nationally-recognized editor, author, and columnist. To learn more about him and his work, please click here. To check out my interview of him, please click here.